We post some of our specialty used bikes online but we also have a large variety of used bikes in all sizes and styles. If you're looking for a budget bike come on by, they go fast! Our used bikes have been donated from friends of the shop, they usually come to us broken so we rebuild them. The cost of the bike is determined by how much time and parts are required to make the bikes safe and good to ride. All used bikes come with a 30 day service warranty. 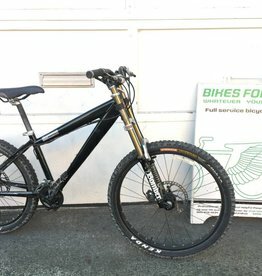 Rebuilt - Norco Rampage 15"